Pretty much leaving Scratch for now. My Featured project has pretty much everything you need to know about me anyway. I'm active on other sites. 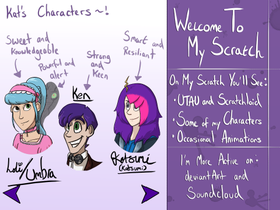 the Waterstone family UTAU project! ScraTAU -- The Studio for UTAUloid Users on Scratch!